Do you want your child to begin learning a second or third language but there is no foreign language at your school? No nearby community classes? No problem! 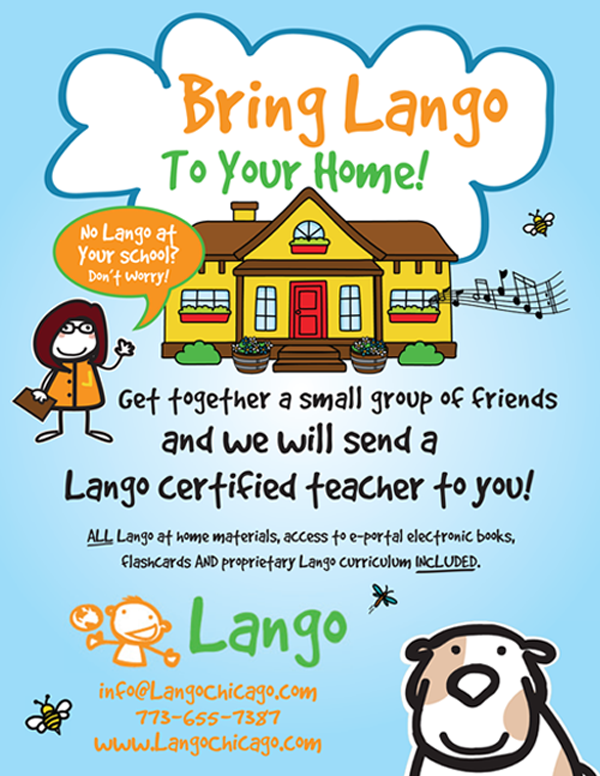 Lango will bring the language adventure to you! We offer private classes for up to 6 students. If you know four or five other families are interested, the price of a class becomes very affordable, and what’s better is that we come to you! You would tell us where and when you would like to have the classes and we will match you with one of our native speaker teachers. Many families choose to have class in one of their homes, or in shared building spaces. We will personalize the class to meet to the student’s preferences and your personal learning objectives. Our adaptive teachers will create activities that incorporate themes that goes with your children's interests. If you prefer an emphasis on literacy, cultural awareness, or tactile exploration, we are happy to customize the class to meet your student’s needs. If you are interested in starting a private class in your neighborhood, and need help getting the word out, please email: ana@langochicago.com for tips and promotional materials. Feel free to ask for our pricing! Looking to supplement your child's current language experience? Lango provides private tutoring sessions for students who are currently in language classes. Additionally, we offer private instruction for students who are not enrolled in classes. This one-on-one or small group instruction can help your learner progress at a rapid pace. We offer discounts based on the number of sessions per week. Click the link below to fill out our interest form for Private Classes or Tutoring. Email your completed form to ana@langochicago.com and we will begin finding a teacher for your learners!